Her dreamy aesthetic and attention to detail create stunning accessories that look cute enough to eat! I’ve personally been a big fan of all things deco for awhile, but stumbled upon Bird & Bear Decoden recently on Instagram and honestly fell in love. Her creations feel so full of magic and inspiration — I wish I could own them all! About the medium: Decoden is an originally Japanese decoration trend. 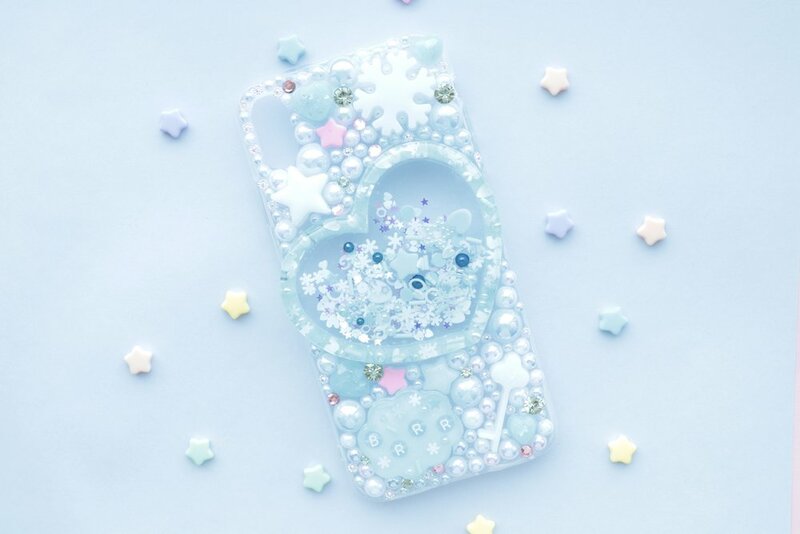 Originally referred to as "keitai art", the Decoden trend includes elaborately decorating items in a whimsical 3D collage design, using pretty plastic pieces, buttercream-inspired glue, figurines, and other knick-knacks. Decoden done right creates a super cute, over the top layered look with a ton of personality! I've always loved crafting and creating things with my hands. 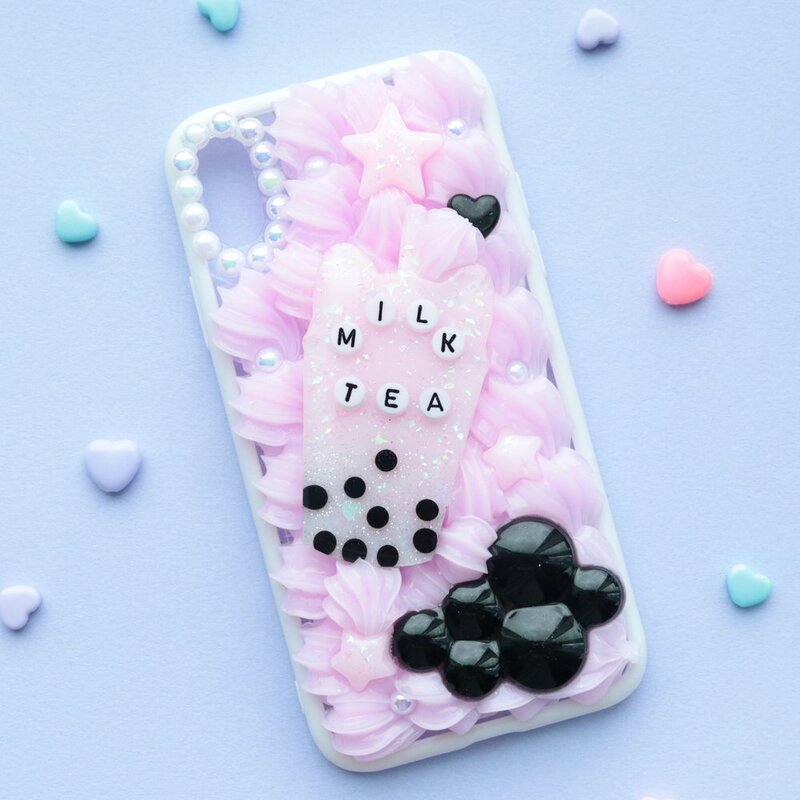 I had been following the Decoden community for a while on Instagram and finally decided to purchase a case from @magicalgirlcafe! That purchase changed everything for me. The moment I unwrapped the case, I instantly felt an immense joy and excitement, I knew I had to give it a shot myself. This started out as a hobby for me but progressively turned into a side-hustle, I'm really excited about the growth. I don't see this as being my dream job as I have my own professional aspirations but I love that my hobby has turned into something more! Everything I make is handmade and unique, I work hard to come up with themes and techniques I haven't seen anywhere else. There can be a lot of overlap in the Decoden community (which is totally understandable), the real challenge is creating something that stands out and is immediately identifiable as your own. I love it when people tell me they can instantly tell which cases are mine when they see them online! Before I apply the whip, I do layouts for all my cases. Balance is very important to me, it bothers me when I see cases that have only huge pieces or only tiny pieces. The secret to a great case is finding a balance of large, medium, and small pieces, as well as pieces that make sense together. After applying whip, I add the resin pieces and then see how it all looks, I check for gaps and add pearls or small resin pieces to fill them. After that, everything should look perfect! I live in a small one bedroom apartment with my girlfriend in Brooklyn. We changed the entire layout of the apartment to accommodate for my growing shop, she's the best!! We took our bed out of the bedroom and put it in the living room, and then set up a craft studio in the bedroom! I have so much more space now, it's so much better than when I was crammed in a corner of our living room. I have so much more freedom to create! Time has been a big struggle, finding time before and after work was tough. Finding a balance between my work life, personal life, and my shop is also something I'm still working on. It's hard because I love coming up with ideas, and once an idea pops into my head, I want to execute it as soon as possible! There's also a lot of pressure in the Decoden community to be original (which I agree with), you want to create something before someone else thinks of it, so you have to move quickly. There is a lot of inspiration/imitation in the community, it's very challenging to not be upset by it every time you see it. As my shop grew, I noticed more and more smaller shops sprouting up and replicating my designs. Plagiarism is something the entire community needs to work on. My rule of thumb is, if I've seen someone else do it, if I've seen someone else use that technique/phrase/supply, I won't do it. Find something else to create and move forward. My advice is to be smart about it and be realistic. Starting a craft requires a disposable income, you have to invest a LOT of time and money and it may be a very, very long time before you earn a profit. Some shops start out thinking their craft can be lucrative right off the bat and immediately get discouraged. It took me months before I started making a profit, and that's with a strong social media presence! Which leads to my next tip, social media marketing. Do not underestimate what a strong social media following can do for your shop. Building my Instagram presence took hard work and a lot of time, I post twice a day, every day. I have a carefully curated feed and I interact with absolutely every comment on my posts! Take good photos of your products, take photos with natural light, no one wants to see dark, blurry, grainy product photos. If you can't take a good product photo, no one will know how beautiful your product is, it's very simple! While in life, follower count doesn't matter, in business it does. As my follower count increased, so did my shop's success. Each follower is a potential buyer, if social media isn't your thing, do research and make it your thing. I spent countless hours watching YouTube Decoden and resin tutorials, scouring eBay for suppliers, and practicing! Make friends with people in your community, you'll make good friends who can help you when you're feeling lost, (you can help them too). You should feel pride in what you create, and if you don't, then keep practicing! Follow along with Bird & Bear Decoden to get your on-going fix!